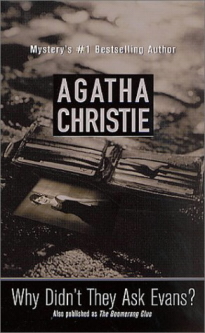 Christie, Agatha. Why Didn’t They Ask Evans? New York: St. Martins, 2002. Warning: This analysis contains spoilers. I take an in-depth look at what makes this book work and why. And it may only be helpful if you’ve actually read the book. However, continue reading at your own risk. For more information on the Friday Analysis, go here. For this book I’d love to talk about THE STORY QUESTION. And just as he reached that point in his thoughts, the eyes suddenly opened. They were blue, a clear deep blue. They looked straight at Bobby. There was nothing uncertain or hazy about them. They seemed completely conscious. They were watchful and at the same time they seemed to be asking a question. Bobby got up quickly and came towards the man. Before he got there the other spoke. His voice was not weak–it came out clear and resonant. “Why didn’t they ask Evans?” he said. And then a queer little shudder passed over him, the eyelids dropped, the jaw fell. . .
What works: The story presents a question for the reader to repeatedly ask themselves throughout the book. Why it works: The question pounds your mind repeatedly, pulling you through each page, and drags you back to read more if you set it down. Hard Rule: Start your story with a question that will keep your reader questioning until the end. Most questions aren’t so obviously presented as in Agatha Christie’s book. But usually the formula goes as follows: the question is presented to the reader at the start of the book — usually the first chapter — and when the question is answered, the book is over. The Wizard of Oz: Will Dorothy get back home again? Pride and Prejudice: Will Elizabeth and Mr. Darcy get together? The Forest of Hands and Teeth: Will Mary find a place outside the gates? *Some series can have the same question for each book, though usually each book also has an internal question that works just for that book. In fact, certain genres usually have a pre-set question. For romance, the question is usually, “Will the boy and girl get together at the end?” Murder mysteries are considered “Whodunnits” because the story question is “Who committed the murder.” While that is a question in Christie’s book, I actually think that the main story question is “Why didn’t they ask Evans.” Smaller questions come to mind — Who are “they?” who is Evans? What were they supposed to ask him? — and all of those help build up the larger question. They are answered bit by bit until finally the larger question as a whole is answered. Once you realize what the story question is, it helps you in two ways. 1. You know when the story starts and ends. Once the story question is answered, the story is over. 2. You know in one sentence what your story is about. Stay true to that sentence as you are writing, and the sentence will keep your story on track. Bring it home: What is your book’s plot question? What is the central idea — the thing that will pull the reader through until the last page as they look for the answer. The question usually ties straight into the protagonist’s motivation.